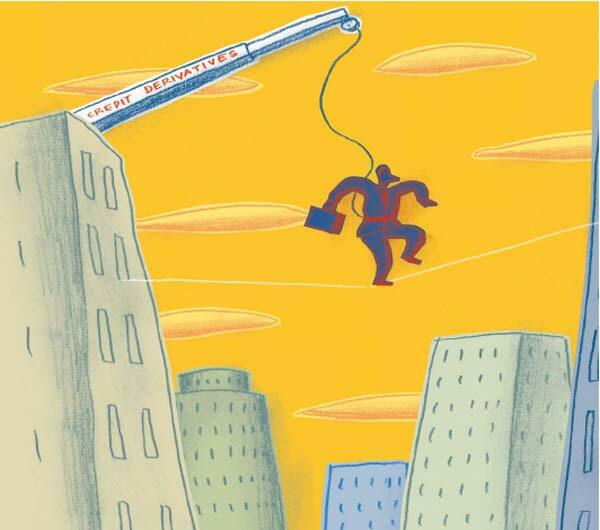 Since its inception back in the mid-1990s, the world-changing potential of the credit derivatives market has been one of bankers’ favorite topics of conversation.The hype now seems to have some substance. Generally regarded as the most comprehensive report of its kind, the British Bankers’ Association’s most recent survey of the 25 leading dealers in the credit derivatives market finds that the global market is now worth more than $1 trillion and is expected to grow to $4.8 trillion by the end of 2004.However, there appears to be little involvement in the market by corporates. Estimates vary as to corporate market share, but certainly it does not exceed 5%. Even then, most of the ‘corporates’ utilizing the market are firms that are in the credit business through subsidiaries such as trading/investment firms or even quasi-banks. There are some signs that this could be changing, according to Andrew Palmer, co-head of global marketing and distribution of structured credit at JPMorgan in New York. 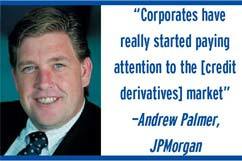 “There are no two-ways about it: Corporate use of credit derivatives is increasing globally. Corporates have really started paying attention to the market, and this year we are beginning to see these firms use the product,” he says. 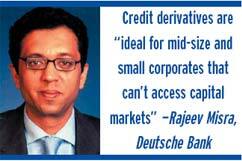 Despite this, there is reluctance among corporates to discuss their use of credit derivatives. One New Yorkbased CFO,however, did agree to talk about his company’s approach, but only on condition of anonymity. “There are some legitimate gripes from corporates: The credit derivatives market is still very young, there have been doubts over documentation,and liquidity seems to be focused at only a few banks,” he says. 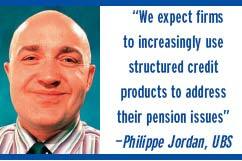 Philippe Jordan, head of corporate and public sector derivative marketing, Europe, at UBS, also believes that credit exposure management is not solely the key to corporate use of credit derivatives.“Firms tend to use credit deriva-tives in a limited capacity to hedge credit risk within the corporation.There are,of course,companies with non-core operations in, for example, Latin America or Eastern Eu-rope that may hedge their capital expenditure and buy credit derivatives in those regions,” he says. There are also theoretical applications of credit deriva-tives to consider,such as hedging the credit risk associated with how a corporate gets paid—whether 60 or 90 days in arrears, for example, Jordan adds. The growth of the credit derivatives market is, howev-er, having a profound effect on corporate treasury activ-ity—not least in connection with raising funds in the bond market. Increased liquidity in the interbank credit derivatives market has enabled participants to short credits, as well as buy or hold them, which has, in turn, facilitated a more ef-ficient and transparent pricing of credit as a whole. Conse-quently, many treasurers now utilize default swap volume and price information when looking for the most oppor-tune time to raise debt capital. Credit derivatives also allow corporates to take more pro-active positions in connection with bond issuance than they could in the past.“We are seeing an increase in the pre-hedging of credit spreads. This is partly because rates are so low and credit spreads are almost as wide as underlying rates. In the past, when interest rates were at 8%,for example,a corporate spread of 100 basis points was less of an issue, but now, with rates at 2%, the weight of that 100bp is much bigger and therefore much more of a focus,” says Jordan. “Spreads are much tighter than they were six months ago. To take advantage of this, some clients are looking to hedge in case they need to borrow money in the near fu-ture,” he continues. “The hedging of credit spreads in anticipation of future debt issuance is one of the fastest growing areas of usage for corporates,”concurs JPMorgan’s Palmer.In doing so,he explains, firms should take into account that there are two ways their credit spreads can move. Either their own spread might widen while the broad market or their in-dustry sector remains static, or both their spread and the market/sector spread might move in tandem so that their spread relative to the market stays constant. The approach to hedging these two eventualities can differ.While hedging by using a default swap on a corpo-rate’s own name could be the safest method—it avoids any exposure to basis risk—it is not necessarily the most cost effective. If a firm is highly correlated to its sector or be-lieves that it will perform better than the sector or the mar-ket more broadly, it makes better sense to hedge against credit spreads generally widening. Until recently, the process for doing so—utilizing total-return swaps—could present challenges as such instruments tend to be rela-tively illiquid and often suffer from wide bid-offer spreads, making it difficult for firms to exit from trades. In terms of short-term investment, Misra suggests firms should look at credit-linked notes.“A lot of corporates have their excess cash invested at Libor less yields with banks as deposits; instead, they could buy a credit-linked note on the bank, which would yield above Libor with the same credit exposure to the bank,” he explains. Selling credit protection can also help with balance sheet management, as buying a bond is essentially similar to selling a default swap. For example, if a corporate were to buy back debt that it issued at 100 but is now trading at 80, the company has a gain of 20 on which it has to pay tax.According to Badrichani,corporates may prefer a third-party such as a bank to buy their debt, with the corporate selling them default protection on their own name, which achieves the same result—the corporate has synthetically bought back its own credit, but its balance sheet is unal-tered, ensuring there is no tax implication. A further variation is to do a leaseback transaction, whereby a corporate sells a property to a special purpose vehicle and leases it back. If the lease is long-term, the amount that the sale raises does not show up as a loan. “The bank can facilitate such a transaction because it is able to hedge the lease as it’s basically a senior secured credit risk,” says Misra. Jordan says that the move to structured products is at different stages in different countries and is being facili-tated by improved documentation and technology.“The first CDOs that were issued three or four years ago did-n’t perform well because the technology wasn’t as ad-vanced as it is today. There was a lot of so-called bar-belling—a mixture of high-grade and low-grade credits—which was satisfactory on the whole, but if the high-yield portion failed to perform, the whole CDO was affected. Now issuers are ensuring genuine diversifica-tion. These products still offer a decent spread against corporate bonds through the CDS market.As a result, we expect firms to increasingly use structured credit prod-ucts to address their pension issues,” he concludes.